I eat nut butters on the regular: on my toast, in my oatmeal, on bananas, on pancakes, on waffles in sandwiches, heck, I put nut butters on everything, just the way lots of people drench their food in ketchup/add ketchup to their ketchup. Basically, I’m a nut-butter-eating-fiend. Major advantage: it tastes unbelievably good. Slight disadvantage: it costs “a lot of coin”. A 500 g jar of organic 100% natural nut butter usually goes for around 8-10$. Due to this advantage/disadvantge combo, almond butter has always been something I’ve wanted to make, but it was always something that I put off, like taking the laundry out of the dryer, or throwing out the clearly expired items in the fridge, opening up all my mail that isn’t personal, etc, etc, etc. 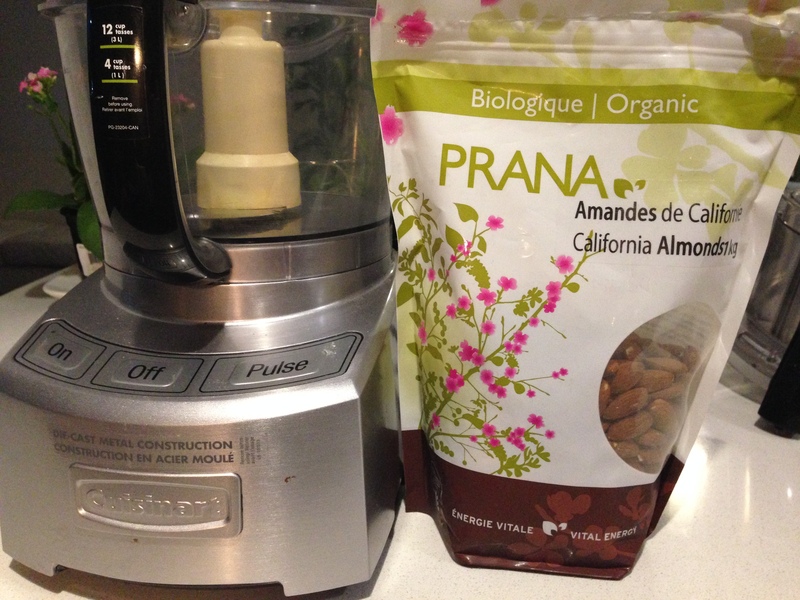 Last night, I decided to grab life by the horns and pulverize those almonds into a treat. Adieu procrastination! The following recipe is actually courtesy of my friend Shauna, so I get no credit for it whatsoever 🙂 I must say my almond-butter making was a “learn-by-doing” experience, although I’m pretty sure this recipe doesn’t even require a functional brain to learn to make. 1. Choose a day you have so much patience you don’t even know what to do with it all (the entire process is looooooong). If you are not a patient person, this may be a great recipe for honing this characteristic. 2. Find 3 cups of almonds (you may use regular or roasted). Because this process generates quite a lot of heat, I don’t recommend using raw almonds as your almonds will not be “raw” by the end of this recipe. If you want a saltier almond butter, you guessed it, use salted almonds. 3. 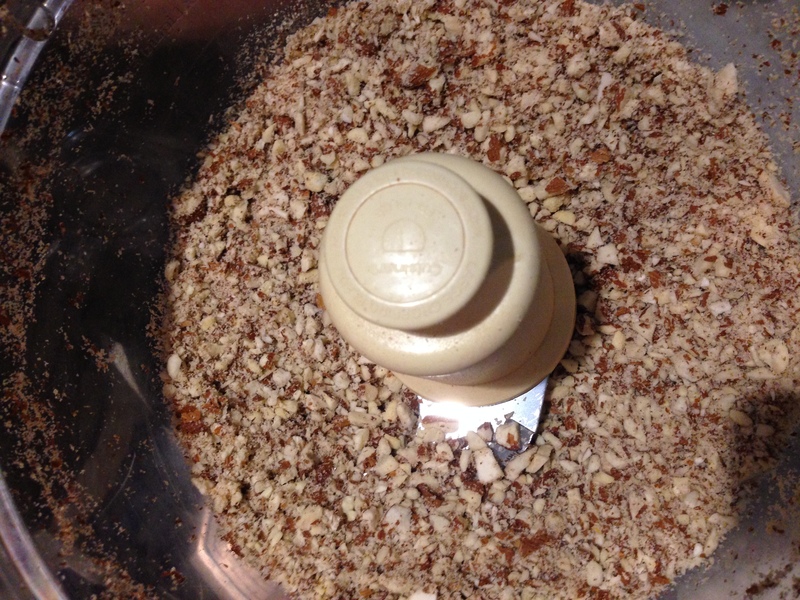 Place your “S-blade” into your food processor, and your almonds into the food processor. Process the nuts, stopping every so often to scrape down the sides as is needed, and watch them go from solid, to liquid, then to gas. Only kidding! 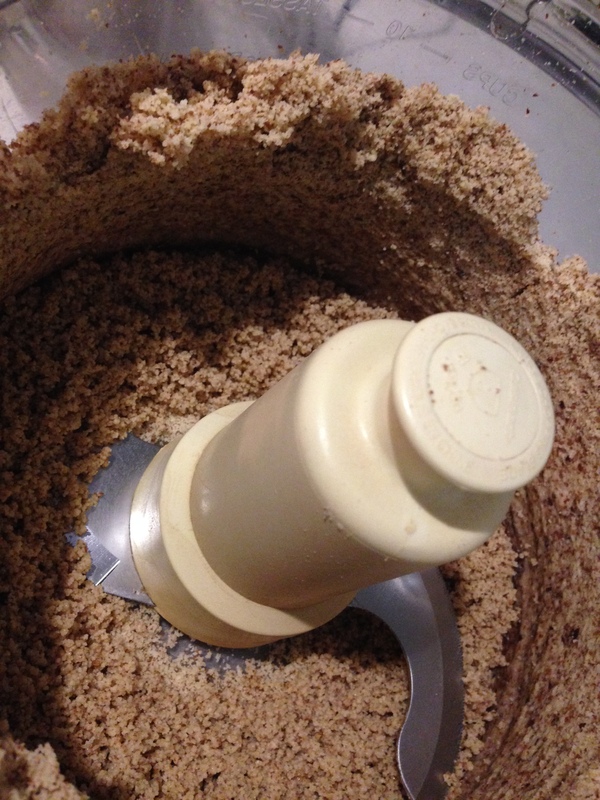 They will go from whole, to chopped, to crumbly, to finely ground, to a paste, to unbelievably glorious almond butter. Optional: add in 1-2 tbsp. neutral-tasting oil to make your nut butter extra creamy. I personally like to add walnut oil in. Very slowly but very surely. 4. Keep using that patience! Stick with it, it is only at the 15-20 minute mark that the almonds will succumb to you (or really the food processor) and the oils shall start to be released from the almonds, giving way to a creamy butter. The total time for almond butter creation is between 20-30 minutes. How do you know when it’s ready? The almond butter is extremely creamy. As aforementioned, the whole shebang usually takes about 20-30 minutes, minus the breaks, all depending on the strength of your food processor. Give your food processor Kit Kat breaks. I tend to be overprotective and maternal with mine, especially when I feel it burning up the way it did when I was attempting this almond-butter making feat. 5. Enjoy this versatile spread my almondbuttersauruses. 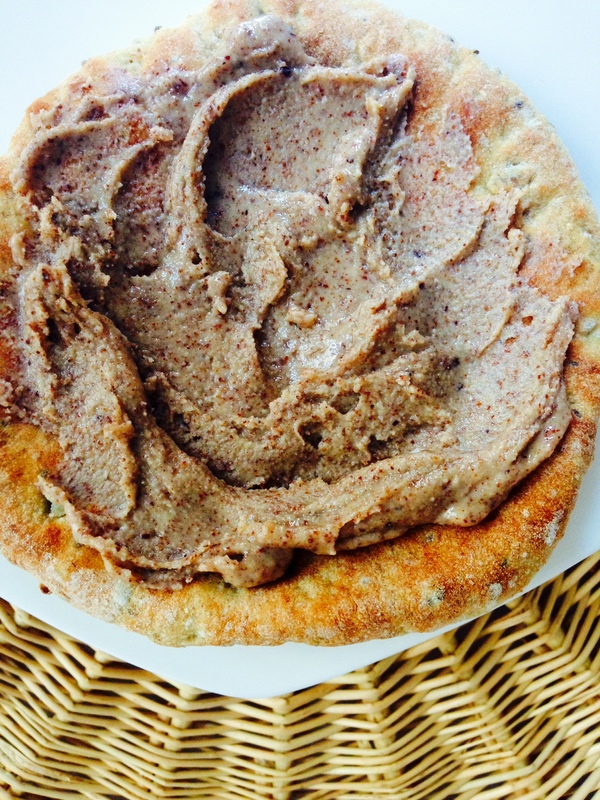 A very unglamourous shot of my almond butter breakfast pita, au natural.